Lock in a great price for Willkamayu – rated 8.8 by recent guests! The owner is a wonderful, kind man. He helped me navigate through local transportation and was very accomodating. He let me leave my suitcase while I traveled for a couple of days through smaller villages. The hostel is quiet and the beds very comfortable. It's a short 5 min walk to the main road where you can catch local buses. Great room! Very spacious and comfortable. Hot water in the shower and very friendly and attentive service. Breakfast is delicious and you can also have dinner. A calm and beautiful environment. This properry was off the beaten path with beautiful views. Very secure and for the most part quiet. Nice clean room very comfortable and clean. Nice bathroom. Very quite and safe. Adequate kitchen not great. This place has a beautiful location, being surrounded by mountains and green fields. The balcony, the dining room and the bedroom itself have nature view. You get a beautiful private room here for the dorm price in Urubamba. You can cook in the well equipped kitchen. Its 8km away from Urubamba, so you need to arrange shopping, food there (1 sole in collectivo, 10-15 min ride). Its a quiet place. I was the only guest here. The owner is very nice and helpful. Accomodation very quiet, clean and the host is very kind. Just a little heads up: The location is not in Urubamba, but Yacahuana. Have that in mind when you book. However, the view of the mountain from my bed every morning was something you cannot beat. Amazing fresh mountain air. The room is comfortable, but it is cold this time of year. You will not be cold at night while in bed, but moving around the room will be chilly. The kitchen has a blender which I appreciated very much. The owner is an amazing human being, he took me to the market in Urubamba to buy fruits since I was on a diet and even took me to the bus terminal when I left. It was great chatting with him in the car. He’s genuinely helpful and will do everything to make your stay pleasant. Absolutely the best host! A lovely family that owns and operates the hostel. It felt more like a homestay with all the personal attention. The room is super clean and very comfortable with the best hot showers. My view from my room was spectacular. They also have a lovely terrace to chill out on. Great value and by far the best experience I've had here in Peru. I had an amazing stay and would recommend this hostel to everyone who is seeking the quietness. It is such a beautiful place full of peaceful nature sounds and you have everything you need: such a comfortable bed, beautiful views over the valley, a hot shower, a functional kitchen (with a huge comedor), an area to handwash your cloths and a very cool partio where you can hang out. And not to forget: a warm-hearted and super carring host! Totally recommendable and there are minibuses every 10 minutes or so that go to Urumbamba so don’t worry that you might be out of reach for food or so :) and Urumbamba is a lovely little town. I really enjoyed my stay and would come every time again. 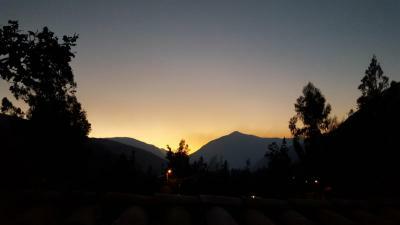 Located in Urubamba, Willkamayu features a terrace. The property is around 5 miles from Bus Station and 5 miles from Sir Torrechayoc Church. Main Square is 5 miles away and Saint Peter Church is 5 miles from the hostel. The daily breakfast offers continental, Full English/Irish or American options. Nogalpampa Stadium is 6 miles from Willkamayu, while Sacred Valley of the Incas is 10 miles from the property. The nearest airport is Alejandro Velasco Astete International Airport, 43 miles from the accommodation. When would you like to stay at Willkamayu? House Rules Willkamayu takes special requests – add in the next step! Willkamayu accepts these cards and reserves the right to temporarily hold an amount prior to arrival. Water only warm never hot. And breakfast was not good enough. Two rolls with one pat butter and a teaspoon of jam. Two tea bags. No fruit, no milk, no egg. It would be nice if breakfast included fresh juice and some fruit. Rarely warm water (on-going construction works). Staff was often hard to reach. Decent room at a decent price. Friendly owner. The bathroom needed some cleaning when I arrived. Ask for the room up the top in the corner with three windows. There was a problem with location as google maps put the location to city centre of Urubamba so we were there looking for the accommodation and then found out it is 5miles away. When we checked in some guy gave us a room that we didn't ordered (3 beds and it was not cleaned either). When we returned the owner welcomed us properly and gave us the right room with a view. There is mentioned that Visa is accepted however it was not when we stayed. We had a room with the most beautiful view I have ever had when traveling. The owner was really nice and friendly. Value for money is really good. Dusty road, truck traffic from new construction. Scenic & mostly tranquil location in the valley where one can hike and observe the local agricultural life. Kind host and interesting guests, a great place to chill. Everything! The owner Hector as soon as I arrived did everything in his ability to make me feel comfortable. The rooms was spacious and had a beautiful view of the mountains, plenty of blankets and the bed was comfortable, breakfast was simple but nice and Hector always asked me what time I would like breakfast, laundry service, use of kitchen with everything you need in it, I loved the location as it was out of the way of everything and quiet, beautiful walks up the mountains, Hector cooked me lunch and dinner for a small fee and would drive me to nearby towns for cheap, wish I could have stayed longer!